This recording is a revelation and, if not exactly the announcement, then certainly the confirmation of a major new voice in contemporary pianism. 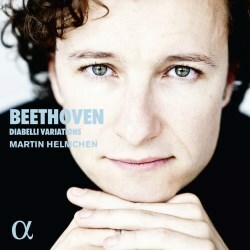 Martin Helmchen has already been turning heads among the piano cognoscenti, and this sensitive, hyper-intelligent account of the Diabellis confirms him as a mighty talent to watch. There are two things that distinguish this performance as being special. Firstly, it’s the dynamism and kaleidoscopic quality of Helmchen’s pianism. Listen to the way he plays the theme, for example: it skips off the keyboard like the sound of a child with a new toy, full of boyish dynamism and skittish fun. Immediately, however, the portentous procession of the first variation comes across with imperial swagger but still a sense of lightness and forward movement. That chameleonic quality characterises the whole performance. Listen, for example, to the spidery delicacy of the second or tenth variations, or the neoclassical elegance of the third and fourth, not to mention the hobnail boots of the fifth and ninth. There is also a growing sense of mystery in the work, as though Helmchen is discovering the work anew at the same time as us. There is a sense of wonder, for example, in the meandering twelfth and the gentle nineteenth variations, and this helps to prepare the groundwork for the climax of the work, the concluding Fugue and Menuet, which here feels very much like the end of the journey because it is the consummation, the fulfilment of so much that has gone before. Importantly, we sense in that final pair of variations that Helmchen has been planting seeds throughout the performance previously that come to bear fruit in the ending: the delicacy and sense of wonderment, the gentleness and the boldness all seem to have pointing this way the whole time, and that makes the journey’s end all the more satisfying. The second special thing, however, is Helmchen’s remarkably mature sense of structure. The booklet notes don’t specify how long the recording took, though it gives the impression of having been breathed out in one long span. Not an entirely continuous one, however. Helmchen seems to group his interpretation around the longer, slower variations (Nos. 14, 20 & 29, especially). Those slow variations are oases in the storm of activity, pauses for breath that allow both the pianist and the listener to regroup, and that gives the impression of an interpretation that has been conceived in definite paragraphs, with coherence and thought rather than just going for it and seeing what happens. That adds to the impression that you are eavesdropping in on something intensely communicative and remarkably intelligent, as though it were a private performance without any of the limitations of the studio. It would be too trite to say that Helmchen’s youthfulness adds to the sense of the work’s lightness of touch, but there may be something in that because this performance is certainly not weighed down by any undue portent or any wisp of being intimidated by the work’s reputation. The final moments of the work bring together all of the performance’s strengths because, after that remarkable fugue and menuet, the final phrase seems to flutter upwards rather than finishing on a decisive full stop. It’s wonderful, and another indication of a great performance by a great artist. Kovacevich, Brendel and Pollini will always have their place, of course, but this new kid on the block has just carved out a very special niche for himself.